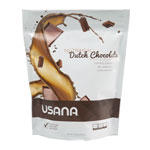 USANA Dutch Chocolate Nutrimeal - Fast food or no food. Too often this is a choice we’re forced to make. We know you want exceptional nutrition in everything you eat. We also know that you are incredibly busy. Between work, exercise, and a list of errands a mile long, the last thing you want to do in the morning before you run out the door is cook breakfast! But breakfast is where a healthy lifestyle begins. That’s why USANA developed tasty and convenient Nutrimeal shakes. They are low glycemic, meaning that the ingredients are formulated to produce only small fluctuations in blood glucose levels for sustained energy and to keep you satisfied longer. Each serving of Nutrimeal contains 8 grams of dietary fiber, which can help maintain a healthy heart and circulatory system. Each serving also provides 15 grams of soy, whey, and other proteins. Soy helps maintain cardiovascular health, diastolic blood pressure, and HDL-cholesterol levels, provided they are healthy to begin with. Soy protein is a complete protein, containing all of the essential amino acids in optimal ratios and in a highly digestible form. Whey protein, which is also easily digestible, is an excellent source of amino acids essential for building a healthy body. Try the rich flavor of Dutch Chocolate for breakfast, or any time you want a healthy meal you shake!